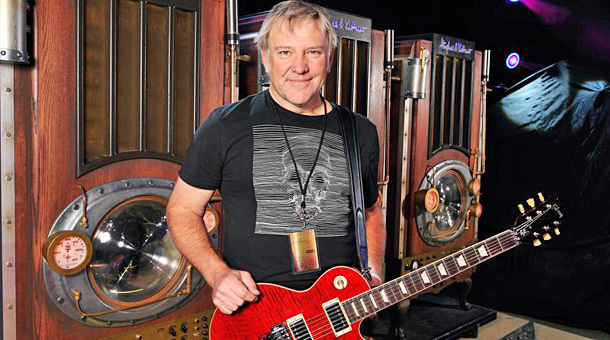 Rush guitarist Alex Lifeson will appear at The Toronto Sketch Comedy Festival in March. The rocker is among the musicians featured in “Hello! Thunder Bay!”, an evening of comedy and music that will see players share their funniest stories from the road. Hosted by Dave Bidini of Rheostatics, the event will include musicians Lifeson, Terra Lightfoot, David Quinton Steinberg, Tom Power and Odario Williams, while Canada's musically-inclined comedians such as Gavin Crawford, Jessica Holmes and Sean Cullen perform parody songs. The 11th Anniversary TOsketchfest will present the best sketch comedy in North America March 3-13 with more than 70 comedy troupes on the schedule. In November, Lifeson and Rush released “R40 Live”, a package that features the group in concert in their hometown of Toronto over two nights last June.